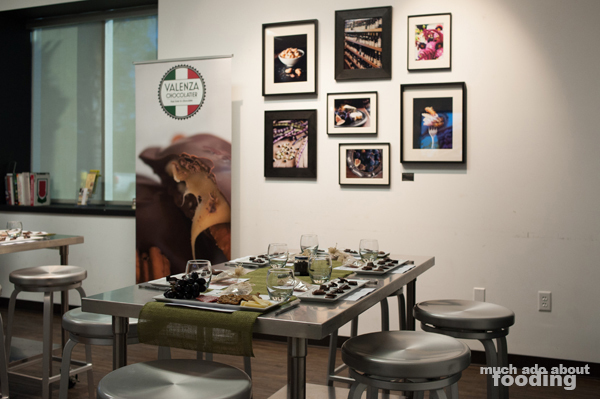 Valenza Chocolatier Masterfully Engages and Educates through "Chocolate Tasting 101"
If I were to tell you that in a span of less than two hours' time, you would be able to describe the taste and feel of any chocolate in your mouth with the same weighty words as sommeliers use for wine, would you believe me? Nary a person in the room seemed surprised that different chocolates yielded different flavor and texture profiles but they did seem pleasantly awed by how distinctive the varying tastes were. 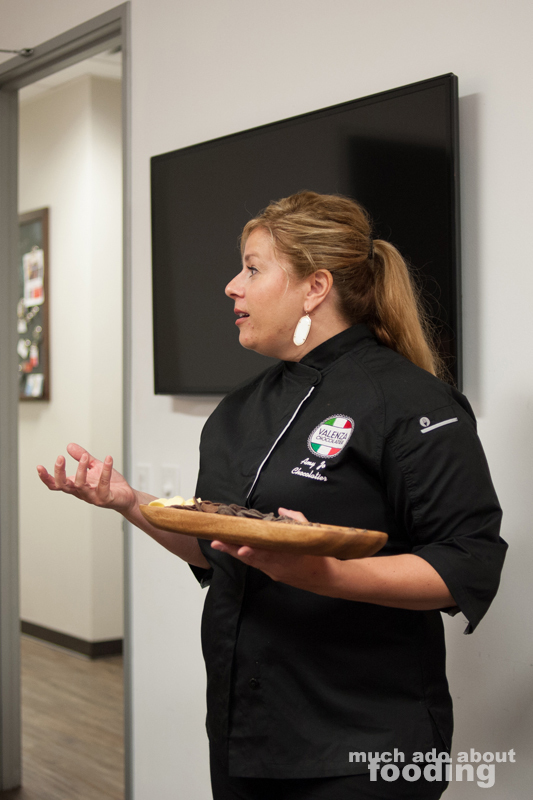 We would have to chalk that up to the excellent guidance given by Amy Jo Valenza Pedone of Valenza Chocolatier during her inaugural "Chocolate Tasting 101" workshop. 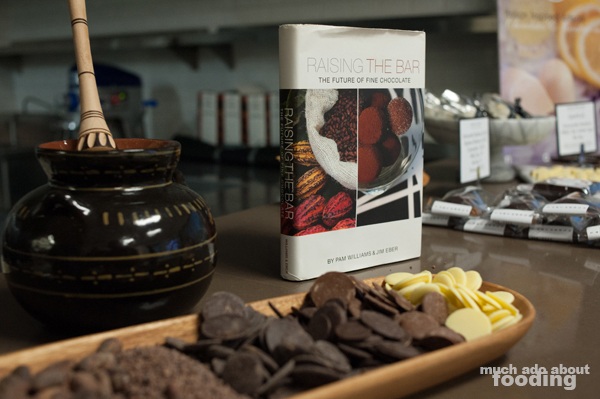 Held on a weeknight in June at the Hood Kitchen space, this introduction to the wonders of chocolate and what it means to really taste chocolate was engaging, interactive, and very educational. It was merely the first in her budding series of tasting workshops (and eventually chocolate-making workshops) and a strong promise of how astounding her upcoming events will also be. 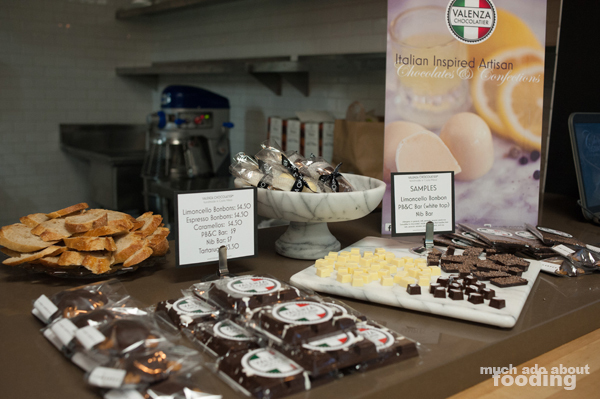 Now that the first Valenza Chocolatier workshop is over, my advice to you would be to get your tickets right now for the next one you can make before the seats sell out. If only I could write out everything that I learned about chocolate from Amy Jo during the workshop to share with you all...but if I did, what motivation would you have to jump on getting your registrations in today? Then again, I can only describe the chocolates we tasted but not have you join along with melty sweets in your mouth. Before we even walked into the room, we could smell the sweetness and cocoa butter from the hallway. The workshop took place in the demonstration kitchen and studio of The Hood Kitchen Space atop stainless steel tables and stools. Every place setting came with a tempting rectangular plate of eight chocolate types, take-away handout, complimentary Valenza Chocolatier chocolate, and name tag. It was to be an interactive session after all so table talk would become necessary. 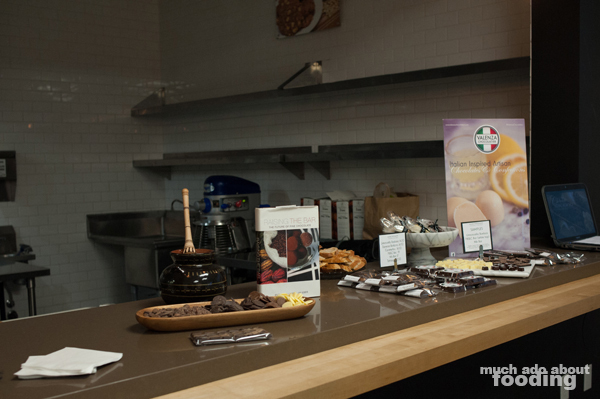 We begun with an overview of chocolate and its history, information that I don't believe anyone else that night knew. It was impressive to listen to Amy Jo, a certified chocolatier, as she explained the production process of cacao and inspiring to see how she lit up as she spoke. We learned about how cacao goes from bean to bar, and every question that cropped up during the explanation was expertly answered. Amy Jo was extremely prepared not only with the "classroom supplies" but also with the precautions for all palates. There were refreshers for tastebuds for in between chocolates and olfactory cleansers per table in the form of coffee beans. We dove into the tasting aspect of the workshop soon after we learned chocolate's history - this was likely the most anticipated portion of the evening for participants but turned out to be more than just eating chocolate. Amy Jo expanded on the steps it takes to fully appreciate fine chocolate by engaging all five of our senses; it was a method she had instructed me on before but not to this detail. As everyone worked their way across their plate, pausing to taste at her cue, they expressed their "aha!" moments with their tablemates and shared what their palates were telling them. It was fascinating to hear how different one person's tastebuds could be from another's. 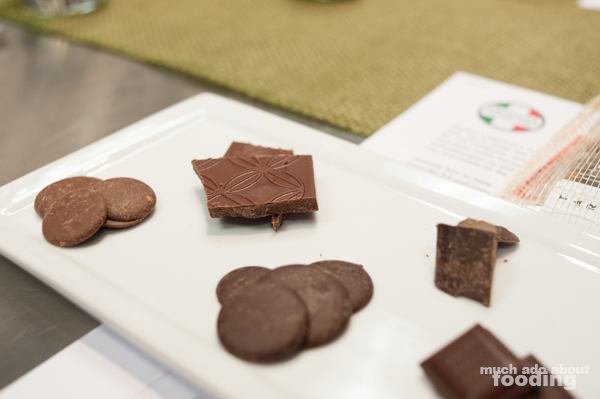 Only bean-to-bar chocolates were sampled for the event in order to give participants the purest available form of processed cacao. As we all co-discovered the weaving flavors and fragrant, intangible scents of our chocolates, we grasped better-educated insights into culture, region, species, and ourselves. What I may have noted as nutty and bread-y, another spotted as fruity like wine; was someone wrong? Not at all, and that was part of the magic that evening as well. Each piece produced a story at the table and also led us deeper into knowing what it was that drew us to chocolate. It would be extremely easy to further dissect "Chocolate Tasting 101" and our experiences during it but that would be feeding answers into your brain without you fully engaging with the ebullient and expert Amy Jo. Not only did we learn a lot about chocolate through this workshop but we also got to watch someone do and talk about their passion. If that's not motivation enough, just think of all the chocolate you'll be able to eat! As you can see from our significant lack of photos from the night, the session kept us riveted. Her next workshop is on July 23rd at 7pm at The Hood Kitchen again - give the events a look over at http://www.valenzachocolatier.com/chocolate-tasting-101/ in case you cannot make the July event. Don't let them sell out before you get a seat!